i just miss these cows, so i want to look back. 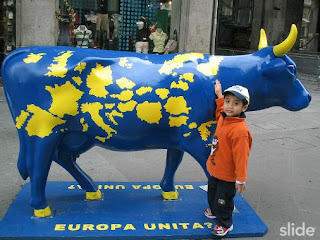 Europe in 1998, cow parade has evolved to become the world's largest public art event. 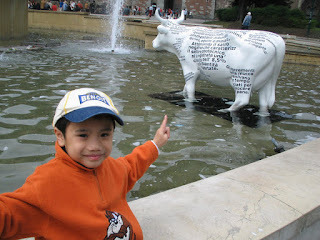 This one-of-a-kind artistic spectacle has stampeded across the globe, capturing the hearts and imagination of artists, and the public alike, wherever the cows have grazed. It was an idea of a famous Swiss sculptor Pascal Knapp. 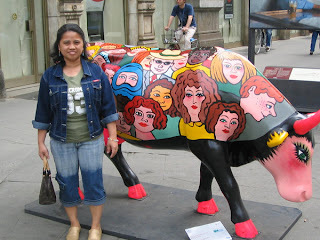 Since 1998, cow parade has been on the scene in 40 cities (New York, Chicago, Sidney, London, Paris, etc..) last 2007, Milan is part again of this art event. April 14 marked the greatinauguration of this open air "cow show". 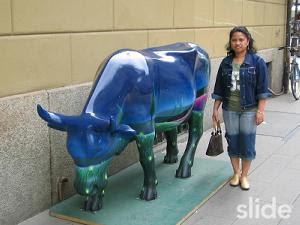 Life-sized cows creatively designed were positioned all over Milan--city proper and parks, and endured until June 17, 2007. In the final event, the cows were bidded (conducted by Sotheby's) & held on Trienalle in Viale Alemagna, Milano. The money from the 'selling of the cows' were given to the ONLUS CHAMPIONS FOR THE CHILDREN. This foundation was pioneered by a great football Milan A.C. player --Clarence Seedorf-- together with some other italian football players, to help the children of the third world. it's been almost 3 years and all i ever see now areminiatures of these exhibited cows displayed in the office where i work. 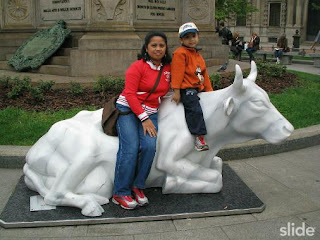 i am glad me and my son Jaki had pictureswith the cows. I'm just here; just trudging through life: observing, savoring, living, loving, learning & laughing; •*´¨`*• figuring out how to render my purpose on earth to the best that i can ´¨`*••••*´¨`*• exploring like the butterfly. 2010 Teena. Watermark theme. Powered by Blogger.